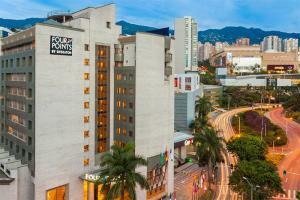 Vacation comfortably with easy access to shopping and entertainment at Four Points by Sheraton Medellin. The hotel is directly connected to Oviedo Shopping Center with over 100 retail stores and three movie theaters. Relax from a day of activity in the hotel’s Ritual Spa’s Turkish bath and sauna, and restore with anti-stress, essential oil treatments. The outdoor pool and whirlpool are refreshing options, along with the energizing exercise room equipped with multi-use machines, a treadmill and stationary bike. Retire to your air-conditioned room with free Wi-Fi and 24-hour room service. Rise to a free breakfast at the on-site restaurant with an all-day menu. Sample Colombian cuisine at numerous restaurants in the area. Located approximately 22 miles from Jose Marie Cordova Airport.